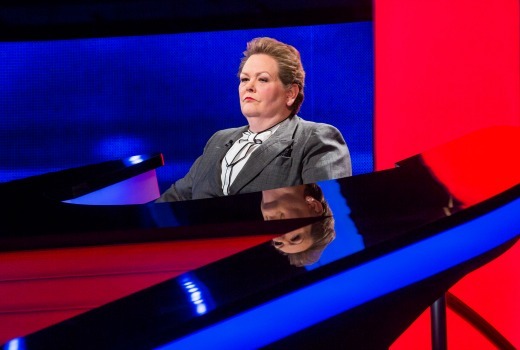 ‘Governess’ Anne Hegerty may have notched up seven years on The Chase in the UK, and nearly 2 in Australia -but she never stops training. Her secret is simple -keep doing quizzes, whether online or in Quiz Leagues, popular in the UK. “There’s different ways of learning and I find the best way to learn is to keep doing quizzes. On a Monday night I go out and play with my quiz league team in Manchester and then on a Tuesday night I’ll be going out to East Manchester to take part in (another) league. “You do get some seriously good contestants here, but there’s not quite the quizzing culture we have at home and you don’t have quiz leagues. But Hegerty does have her weak spots, some of which will appear in The Chase gameplay. Along with Mark ‘The Beast’ Labbett, she has had to become expert in Australian trivia. “Mark and I get kind of paranoid about our Australian knowledge and we’re always trying to improve it. We’re always worried that we’re going to be blindsided by an Australian question,” she admits. “I try very hard to get better at pop culture because I’m more of a highbrow quizzer. The British Championships tend to have a highbrow quiz and a lowbrow quiz and my ambition is always to do well in the lowbrow. “Since I started quizzing I began paying more attention to the charts, which I really stopped listening to in about the mid 1980s. 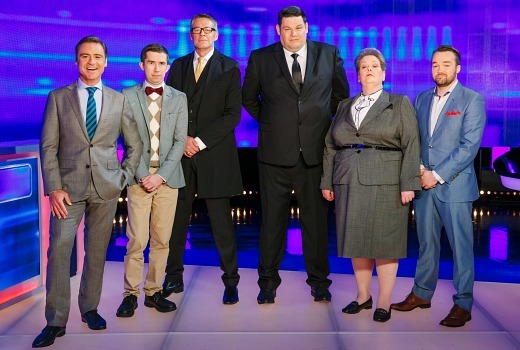 Hegerty and Labbett visit Australia several times a year for recordings of the Seven game show, joining local Chasers, Matt ‘Goliath’ Parkinson, Issa ‘Supernerd’ Schultz and Brydon ‘The Shark’ Coverdale. “What tends to happen is the Brits come out two or three times a year and then do a whole load shows when they’re here and then go home. “I remember the very first series I did in July 2015 the questions in the final Chase were quite easy and quite short. So they were getting through loads of them. I came back to the UK in such good form really, because I’d just be powering really fast. Tons and tons of questions. It really gets you in the zone. “Andrew (O’Keefe) is very technically good. He really knows what he’s doing. He’s good at putting contestants at their ease. “But Australia has longer ad breaks so we have to cut it down by about three to five minutes. So Andrew doesn’t throw to me as often as Bradley (Walsh, host) does in the UK. Hegerty got her break in the UK as a female winning against men on the local quiz circuit. “Quizzing is this sort of small incestuous community and it meant that people were suddenly aware that there was a new female quizzer out there, and there really aren’t a lot of really good female quizzers,” she recalls. After one quiz win she was approached by a man who “I’ve subsequently described as the largest man I’d ever seen in my life. That lead to producer interest, auditions and the creation of The Governess character. “What I meant was that a governess is a free agent. She’s not got the Board of Governors breathing down her neck. She’s more like Mary Poppins, she can do anything she likes. So it was just to give me a bit more freedom than a headmistress would have. Since its launch in September 2015 the Seven show has been winning its timeslot, causing headaches for Nine in the all-important pre-News timeslot. Nine is rumoured to now be on the hunt for a replacement show, with no word how that will impact the long-running Hot Seat. While Seven network execs are happy to be winning the slot, Hegerty’s competitive edge is more focussed on the next round of questions and maintaining her reputation. She recalls a recent episode where a team got the better of her in the Final Chase round. “We all hate losing,” she sighs. “I kept getting things wrong. It was a very good team and they kept pushing me back. I thought ‘Why do I keep getting those things wrong?’ So sometimes you just have a brain fart. “We’re all human and it’s extremely easy to ask us huge amounts of stuff we don’t know anything about. The Chase airs 5pm weekdays on Seven. I saw her on the Good Friday appeal and she was almost unrecognisable in a different outfit. I was lucky enough to appear in one of the earliest episodes of The Chase and Anne was our Chaser. She was an absolute delight. It was her first time in Melbourne. For the record, we got all four team members back but lost by three seconds. I’d encourage anyone thinking of auditioning to go for it, its a great experience. She is great but it’s about time there was a female Chaser from Australia. I suggest Cornelia Frances. I’m not aware of any quizzing competitions won by Cornelia Frances. Hosting Weakest Link doesn’t count. Then what about Leanne Benbow who won the top prize off of Deal or Deal? There’s also Lisa Paton the first contestant to have got the chance at playing for a million on Million Dollar Minute. The article was most interesting. Thanks for an excellent well-written article on Anne. Thanks Nate & Jude for nice words. Very interesting and enjoyable reading.